Currently, there is a huge revival of interest in fermented foods and we too have become fascinated and have had lots of fun experimenting in the last couple of years. In this course we’ll pass on what we’ve learned and try to take the mystery out of this almost forgotten skill. So what exactly are fermented foods? For many people the term sounds mysterious, intimidating, and maybe slightly off-putting. Fermented foods have been a traditional part of diets around the world. However, in recent times our Western diet has become increasingly deficient in many of the nutrients that fermented foods provide. Why? Because so much of our food is highly processed, and most natural foods are now also pasteurised as a matter of course. During this half day course you will learn that fermentation is a vast subject, many of our favourite foods and drinks are fermented to a lesser or greater extent – bread, wine, beer, cheese, cider, mead, coffee, tea, chocolate, pickles, salami, kimchi, sauerkraut, miso, soy sauce, yoghurt, kefir... This course will familiarise you with a wide variety of fermented foods and you will get to see and taste them for yourself. We’ve learned from the best! We met Sandor Katz – the King of Fermentation – when he came to the Ballymaloe LitFest last year, and his fermentation talks were standing room only. He gave a fascinating talk and we will share some of the knowledge with you. There is a real hunger for knowledge of this almost forgotten skill and it is something that we are so excited to share with you. Learn how easy it is to make many of your own fermented foods at home. 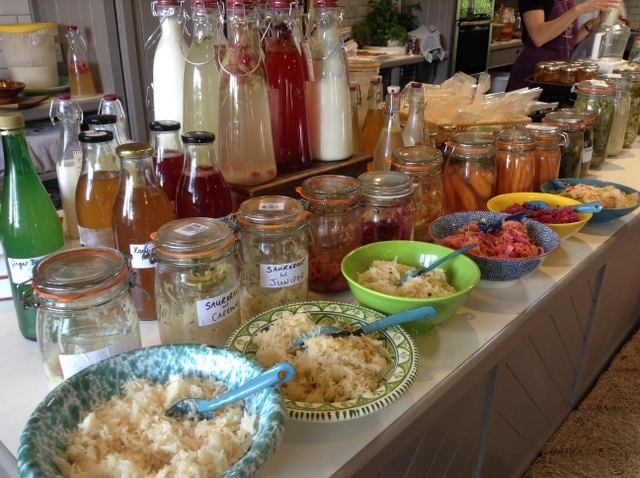 From kefir to kombucha; German sauerkraut to Korean kim chi, krauchi – a marriage of both! Learn how to make and look after these superfoods with ease, as well as discovering a selection of our favourite recipes that use them. If you grow your own produce you will discover myriad ways to preserve the bounty of your harvest and enjoy it through the winter. A diet rich in fermented foods is known to have tremendous health benefits. The process of fermentation increases vitamins, antioxidants, enzymes and beneficial bacteria naturally present in food – improving flavour, enhancing digestion and boosting immunity. But most of all they are delicious and we at the Cookery School are passionate about them. We can’t wait to share our extensive knowledge with you… and send you home with some of our cultures to get you started. Courses on during week of 3rd February.